Hi kids, it´s me, Tim Turbo. The youngest bambino of Berlin´s famous anti-hippie-yard from Planet Rock Street. My old bloggin-home Cyan Wait is on hold now and therefore I´m going to provide you with basses every thursday henceforth here at seen..
At Cyan Wait it was my job to search for new music and Emil was the writer. I´ll keep that principle and will do a weekly mix for you of what I liked in the last weeks. Some brand new tunes, some tunes are a few weeks old and some are just unknown until now. This time I start easy, because I don´t want to scare you with my extraterrestrial bass taste yet. 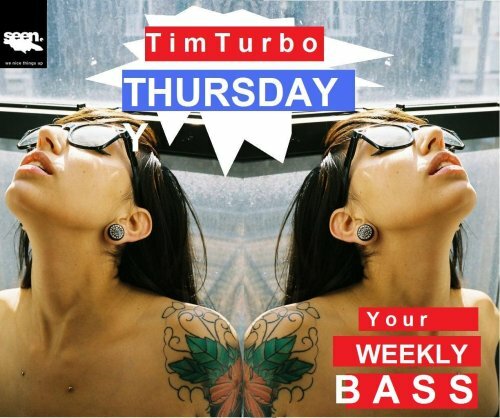 It´s Thursday – Basses for the masses! Check the video to “The System” with beautiful pictures of Afflicted Yard´s Peter Dean Rickards, German Rap´s feuilleton Marcus Staiger about Terry and Wildlife!´s Cristle Castles remix of “Knight Crusade”. San Francisco’s Bassnectar got a new EP out and an upcoming full-length, preaching his bass-heavy, anti-corporate message! Ghislain Poirier send me this tune, claiming it’s good and as a matter of course it is not just good, it’s pure fire. He toured with that “neoelectro afrobotic ethnotechno” gang Playdoe in France and the tune he send me is done by Sibot, who is one half of Playdoe, featuring the South African rapper Teba. Mad Decent introduced Nadav Ravid aka NDV to me. He is a DJ remixer from Israel, Part of the DJ team Botanika and the creative duo Polar Pair . He got a remix compilation up, remixing only tunes by Israeli Artists. The one below is my favourite, since it’s a blueprint for dancehall influenced Bass: heavy electronic instrumentation, chopped vocals and some guy toasting on top. Israel peeks beyond their own nose. Follow! Again off “Kingstonlogic 2.0″. Fire on International Monetary Fund, or so ??!! This one is a little older: Taranchyla, MC and Selecter for Poison Dart thinks that it is fundamental to know that everybody in Flatbush is dancing the Nuh Linga now. So he made a dancing tune and I thought the dancing tune segment was death. They say the riddim is selfproduced and called Bionic. I say its tectonic. Destruction. Mudd up! Discovered this hell of a Busta tune and added two more Arab-styles. International. And check out Busta doing the “Arab Money Dance” at Westwoods show. The tune is off a mixtape called â€žDancehall Brasilâ€œ Maga Bo posted on his blog. Compiled by Jimmy Luv from Sao Paulo, it´s 59 minutes that represents reggae/dancehall artists from Brasil. It´s not all worthwhile, but there are some decent tracks on there. Get it here. Check the video for the tune. Lexie Lee off South Rakka´s “Remakes Come Again – Greetings To All Raggamuffin”. Oldschool 2.0 flavour. Dutty Artz found this heavy electro-rap-banger by a girl called Nicki Minaj. Check this interview to get to know her. Modeselektor did this inapprehensible trancehallhybrid featuring the original Don Gorgon on the vocals. It´s from 2007, but I think nobody realized how stupefying this masterpiece is. looking forward to your mixes. do you have someday any sets in berlin anyway? Yes!Very nice,especially d short comments 2 all tunes…keep it up! @all basslovers: only one week to go till modeselektor total freak out @rote sonne,munich!